"This is an epiphany for me"
A woman who joined one of our focus groups said, "This is an epiphany for me." She was living in a domestic violence shelter along with her two children. She was concerned for them, as they grew up living with domestic violence. She didn't know how to talk to them about it. She didn't know what to call it. Further, she didn't until that moment connect the fact that she, too, grew up living with domestic violence. She experienced Childhood Domestic Violence. "They don't often connect the dots..."
This young woman is not alone. Dr. Renee McDonald, a leading researcher at Southern Methodist University said, "They often cannot connect the dots between what they experienced in their childhood homes and the challenges they face today." Dr. McDonald was specifically talking about Childhood Domestic Violence. Most people have heard of physical child abuse, sexual abuse, emotional abuse, and neglect; these are all adversities that a person might face in their childhood home. However, there is one adversity that most people probably haven't heard of, as it has very limited awareness... that adversity is Childhood Domestic Violence, or CDV. CDV impacts a person in a number of ways. One in particular is that it encodes a series of negative beliefs, or LIES, in the developing brain. And since one of the brain's primary jobs is to find evidence of what it believes is true, more often than not, the negative beliefs formed for a person who experiences CDV become the foundation of that person's self-concept throughout life. So how does the self-concept of a person who experiences CDV change for the better? The impact will often stay with the person unless someone steps in to help them unlearn what was learned. In the life of a child, a caring adult must step in to help the child become aware, understand, and share. The same holds true for an adult. But how can this happen when there is no awareness? The single best predictor as to whether or not a person will be involved in domestic violence later in life is whether or not they grew up living with it in their childhood home. 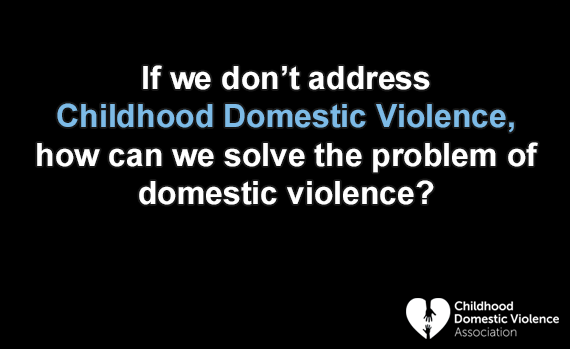 So, if we don't address Childhood Domestic Violence, how can we solve the problem of domestic violence? It's like trying to solve lung cancer without addressing the problem of smoking. We must provide the adults who experienced Childhood Domestic Violence -- all 40 million of them in the U.S. alone -- with the information they need, so they can begin to connect the dots and take the first steps towards becoming aware, understanding and sharing. Only then can they share these messages with their own children and other loved ones. In the same way that we've educated children about bullying in school, we must also educate them about the adversities they are facing in their childhood home. A more holistic approach to the issue of domestic violence is needed to help the millions of children and adults that are impacted. We need to bring the tools and information to those who need them. Most critically, we need to address the single best predictor of it -- Childhood Domestic Violence. Do you want to learn more about CDV, domestic violence, and the tools and resources available? Visit the Childhood Domestic Violence Association at www.cdv.org and the National Coalition Against Domestic Violence at www.ncadv.org. Need help? In the U.S., call 1-800-799-SAFE (7233) for the NationalDomestic Violence Hotline.